This project is a very exciting one for me because it is very personal to me and my family. 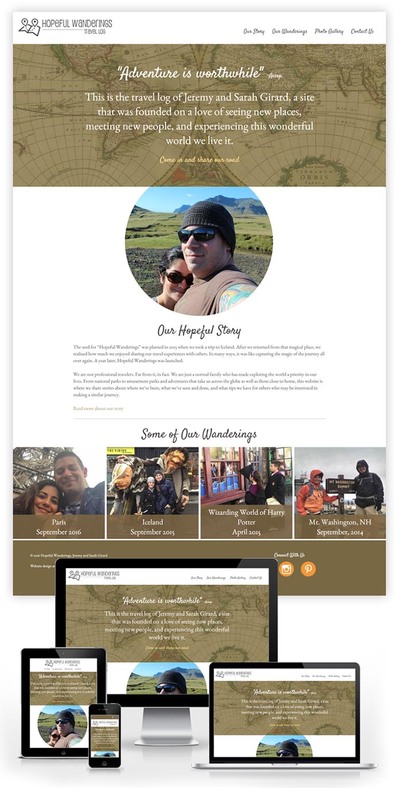 Hopefu Wanderings is our family's travel log, "a site that was founded on a love of seeing new places, meeting new people, and experiencing this wonderful world we live it." After a trip to Iceland in 2015, my wife and I realized how much we enjoyed not only traveling, but also sharing our experieces with others. Having read plenty of travel websites and blogs during our own research into certain trips, we decided to start our own site to "share our road" with others. The design for Hopeful Wanderings actually started as a project I was working for the classes I teach at the University of Rhode Island. This design became part of a new set of lab exercises I was developing. Once I was done with those labs, I realized how much I liked the overall design, so after a few tweaks, I decided to use it for our own travel website. The site itself is fully responsive and built with the ExpressionEngine 3 CMS platform. The main focus of the site is the "Wanderings". To get started, I wrote up content for our trip to Iceland as well as a few others. We were also just about to take a whirlwind trip to Paris, so that wandering was added to the site as well. Since the individual Wandering pages are the meat of the site, i spent a lot of my time focusing on those, especially how the images would be integrated. In the end, I came up with some grid systems that allowed me to create a framework that I can use on all the Wanderings now and in the future. One other item of concern that I had with this site was download speed and performance, especially on those Wanderings pages. For instance, the "Iceland" page contains over 80 large images that are presented throughout the long piece. The overall download weight of that page is i the neighborhood of 15mb! I knew that I could not force that download on all visitors up front, so I worked to find a good Lazy Loading solution that would allow me to defer those images until a visitor actually needed them. In the end, I went with Unveil from Luis Almedia. I have big plans for this site over time and I am very excited to add new Wanderings to it (of course I am, new Wanderings means I get to travel more).